phone Chris on 07501 973648.
or contact us with your e-mail address, mobile phone number and numbers of youths/adults interested. Introductory Courses - our 2019 courses will follow the new BC Paddle Awards Scheme. leading to Start, Discover and potentially Explore awards in kayak or canoe for all ages (11 to 60+). 1. Starts Tuesday 21st May 2019. 2. Starts Friday 17th May 2019. Saturday Junior Academy - learn to kayak/canoe for 11-15 year olds, leading to Start, Discover and potentially Explore awards. Starts Saturday 11th May 2019. Want to try canoeing - why not come to one of our Open Days. Try out kayaks or canoes at AVCC with 10-15 minutes on the water to see how you like it. Anytime between 11:00 and 13:00. We will probably run the Open Day on two of these three dates and will confirm nearer the dates when we know the weather. Taster Sessions for groups or schools. Spend some time with us paddling on the Axe estuary or sea. We can do evenings or some daytime slots. The number of sessions we can run each year is limited due to all the other activities, so make sure you ask early in the season. Sessions are held at the Flamingo Pool in Axminster on Friday evenings, usually in October/November each year. A warm environment in which to practice support stokes (avoiding capsizing) and rescues (in case you or someone else does). See the Winter Programme for details. Please ask the coaches/leaders about progression to BC Personal Performance Awards and how we can help you achieve this. 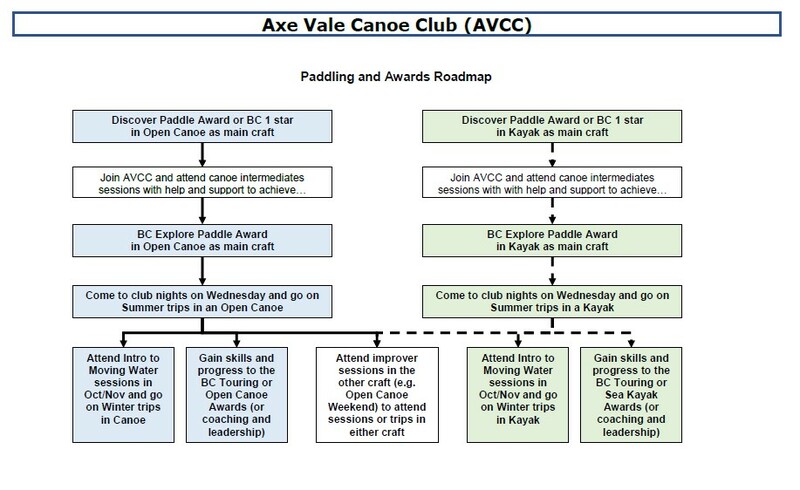 BC Personal Performance Awards are split into several disciplines and you can choose which path to undertake: Touring, Open Canoe, WW Kayak, Sea Kayak, Surf Kayak, etc. So please ask for advice. The Club scheme described below is overseen by the Club Coaching panel and is designed to encourage members to become coaches and leaders for club events and courses.